This issue marks Captain Atom’s seventh birthday and his twenty-seventh published adventure (including his story in Peter Cannon… Thunderbolt #53 and excluding the reprints in Strange Suspense Stories). It begins on a golf course. Two men come upon a pretty blond woman teeing off. She knocks her ball into the rough, and the older of the two men (identified as “Professor Bolt”) goes in after the ball. Next to the ball he finds a ruby. As he picks it up to examine it, a wire shoots out of the trees and ties itself around his wrist. An electrical charge shoots down the wire and stuns Professor Bolt. The wire is being manipulated by a flying man dressed as a jester. The woman calls him “Punch” and uses the ruby to hypnotise Professor Bolt into submission. As Punch takes the professor to his car, the woman sets off to hypnotize the other man. Later that day, in Washington, news reaches Captain Allen Adam of the missing scientists. He is at Alec Rois’ house, enjoying the pool with Eve Eden (Nightshade). Neither of them is aware that their friend Alec is actually the Ghost (from Captain Atom #82). Adam is trying to get Eve to reveal more of herself to him when a massive gem appears out of nowhere and encloses Rois within it. It explodes and appears to vanish, knocking the heroes out cold. 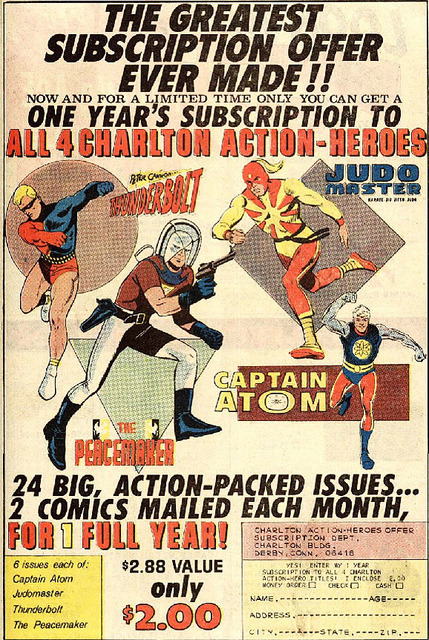 Apropos of nothing, there’s a cool ad for Charlton comics on the next page. Upon recovering, Captain Atom and Nightshade report to the Pentagon. Their chief believes they were hypnotized. 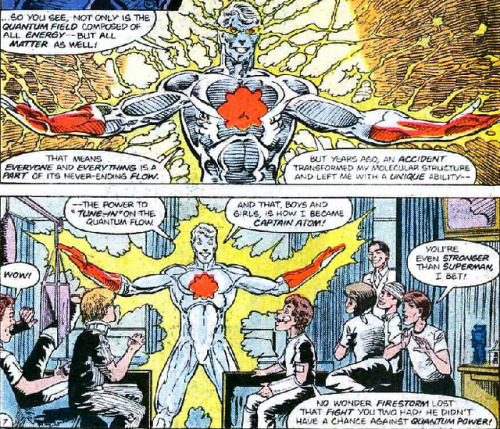 Although he wants to send them both looking for Rois, Captain Atom has to report in for some tests. Nightshade is sent to the Long Island golf course where Bolt was taken. Meanwhile, in their secret lair (on Coney Island), Punch and Jewlee reveal how they came about their powers in a sloppy bit of exposition. They were “cheap carny crooks” who came across a mysterious chest on the beach. In the chest they found pixie boots that gave the wearer the ability to fly (which Punch wears) and special “hypno-gems,” complete with a mind-recording device that explained how they are used. They use their newfound powers to purchase an old carnival and build a cool lab within it. They have been kidnapping scientists and recording their “brains” for unknown reasons. They set out for upstate New York in search of another scientist, Lewis Coll. Coincidentally, Professor Coll has been running a barrage of tests on Captain Atom all day. Feeling weak from the workout, Cap drinks a tranquilizing draught that will make it easier for Coll to measure the radiation he emits. Unfortunately, it is while Atom is in his weakened state that Punch and Jewlee burst into the lab. Punch gets Cap with the electric cables while his partner puts Coll under her spell. Cap tries to use his communicator belt but Punch stops him. 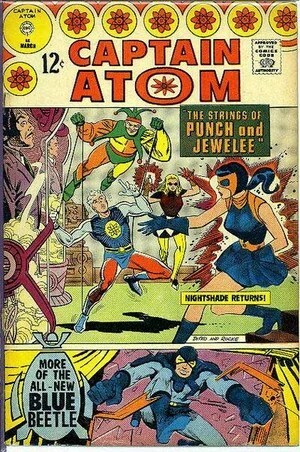 Punch and Jewlee steal Coll’s helicopter and fly away with Coll and Captain Atom under their influence. Cap was able to send a repeating signal from his belt which directs Nightshade to Coney Island. When Captain Atom regains some strength and takes a swing at Punch, Punch hits him with a burst of electricity. Cap is thrown in with Rois, who is now only feigning the symptoms of being under Jewlee’s spell. Alec isn’t happy to see the meddling Captain Atom. It is because of Cap that the Ghost’s teleportation circuitry on Alec’s arm can no longer be removed. Captain Atom begins to come around. Skulking around the old carnival on Coney Island, Nightshade sees Punch and follows him. Her super power is finally revealed – she can become a shadow. 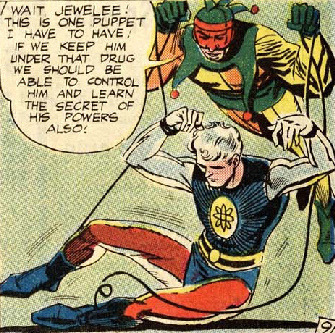 Punch and Jewlee have Captain Atom hooked up to the brain recording device. They reveal that their plan is to sell all the scientific secrets they have stolen to the highest bidder. Nightshade steps out of her shadow and attacks Jewlee. Cap bursts out of the machine and goes after Punch. Rois takes advantage of the distraction to teleport some of the duo’s equipment to his own lab. Captain Atom gets the upperhand and yanks away Punch’s electric lines. Cap follows Punch into one of the carnival rides (the Tunnel of Love), punches him again, and takes the villain back to his lair. Nightshade, who has beaten Jewlee, is busying herself restoring the memories of the kidnapped scientists. But Jewlee regains consciousness and makes a break for it. Alec Rois realizes he can stop her but does not. Jewlee escapes. In the last panel, Punch is plotting revenge on Captain Atom and Nightshade from his prison cell, as are Jewlee (on the lam), the Ghost (Alec Rois), and Abby Ladd, the reporter who wants to expose Captain Atom as a fraud. The letters page of this issue mostly applauds Steve Ditko, his work on Captain Atom, and especially the backup Blue Beetle stories. However, John Angell of Winston-Salem, NC (hey I used to live there!) thinks the new Captain Atom is a stinker, unoriginal and stupid. 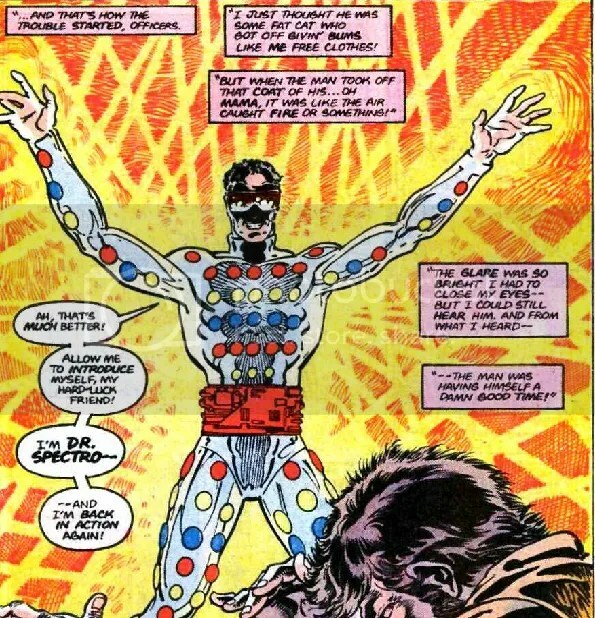 He challenges Charlton to rise above the sort of storytelling DC Comics resorts to (funny, considering where Captain Atom ended up after Charlton). This issue also includes another Blue Beetle backup by Gary Friedrich and Steve Ditko. 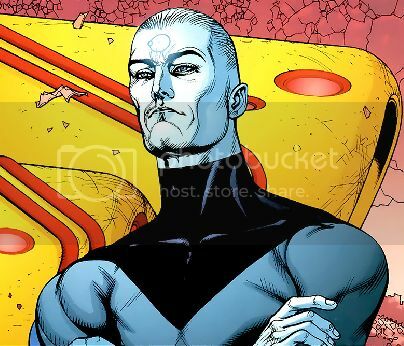 At this point I think the character deserves his own title, but that’s still a few years down the road for him (there was a brief Blue Beetle series from Charlton but it only ran five issues). The storytelling of “Strings of Punch and Jewlee” leave much to be desired. The clumsy exposition only served to make the two major villains more two-dimensional. I like that Alec is Allen and Eve’s friend while neither the heroes nor the villain are aware of their enemy’s secret identity. But one thing I hate is sloppy continuity (Alec Rois was Alec Nois when we first met him). The artwork is superb, Ditko and Mastroserio are a good team. It is this issue’s saving grace. I give Captain Atom #85 a C+.